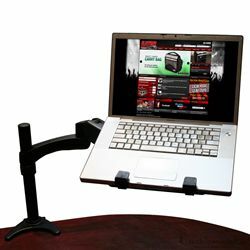 360 Degree Articulating G-ARM, Desk Mountable. Mounts to any Gator "ARM" case or any table top surface. It easily adjusts in six directions, with a 360 degree horizontal adjustment, with heavy duty table clamp included. Tray included that can accomodate laptops and iPad style tablets.